Hello, my name is Claire and I am a 43 year old mother of 3, 2 boys aged 18 and 8 and 1 girl aged 11 We live in a 5 bedroom house, which consists of a large playroom and also enjoy the benefits of a large garden for the children to roam around in. I enjoy helping all children to learn and develop through their stages of their young lives, which involves lots of messy play, cooking, outings & adventures and multi-cultural celebrations. I also benefit from having lots of playgroups and parks in my local area. I have completed my CHIP course and First Aid in Paediatric. I am also DBS checked. I have completed my EYFS . My hours are 7am - 6pm but can be negotiable. I am available every day for drop offs & pick ups at Spelthorne School, Ashford. These will be discussed as per individual child at my setting. Below are the latest reviews for baby lou. Please note that reviews represent the subjective opinions of other Childcare.co.uk users and not of Childcare.co.uk. Parents must carry out their own checks and references on childcare providers to ensure that they are completely happy before enaging in the use of their services. Claire has been amazing with our daughter. She has been with Claire 4 days a week since August and she loves her time there. She has a lovely environment for the children. She loves the different activities that Claire does with them including messy play, play groups, painting and baking. I feel that my daughters confidence has grown and her speech is coming on really well too. I would highly recommend Claire to anyone. What can I say, Claire is amazing! My now 17month old daughter has been going to Claire 3 days a week since March and she absolutely loves her and her family especially "Oliber" Claire really does treat Ivy as if she is her own, and I sometimes even struggle to get Ivy to leave at the end of the day as she loves being there so much. Claire has completed many activities with Ivy such as painting, baking, visiting farms, play centres, parks/splash pools. I have watched Ivy's confidence grow whilst spending time with Claire and her family and she is very happy to be around other people turning into a very sociable young girl. Unfortunately Ivy will be leaving Claire in December due to Baby No. 2 arriving in Jan but I hope to stay in contact with Claire & Family and use Her again in the future. I highly recommend her as a childminder. Claire looks after my 1 year old son 5 days a week, as both parents work full time. She is everything we could have wished for. He has lots of fun playing in her lovely home or at play centers, and is always well looked after (fed and clean). Claire sends us photos of him to keep in touch, and he is always happy when we drop him off and pick him up. We have no hesitation in recommending Claire to others. Clair collects my son from nursery four day a week my son loves going to her house he comes home everyday with a new adventure. That's so nice when your a working mum to know your child is happy. Claire treats him like her very own children. 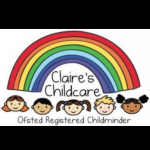 I would definitely recommend clair to have your children she is very welcoming, kind lady she loves getting involved with all the children.